Traditionally nDPI was used by ntopng to detect flows L7 protocol. With the advent of more and more protocols, speaking about single protocols is often too difficult. Users usually are not interested in the specific protocol but rathen on a whole group of protocols. For example, it’s easier to reason about VPN traffic as a whole rather than a particular VPN implementation. The picture above shows the Collaborative category being reported on the flow details of a Github/DNS flow. 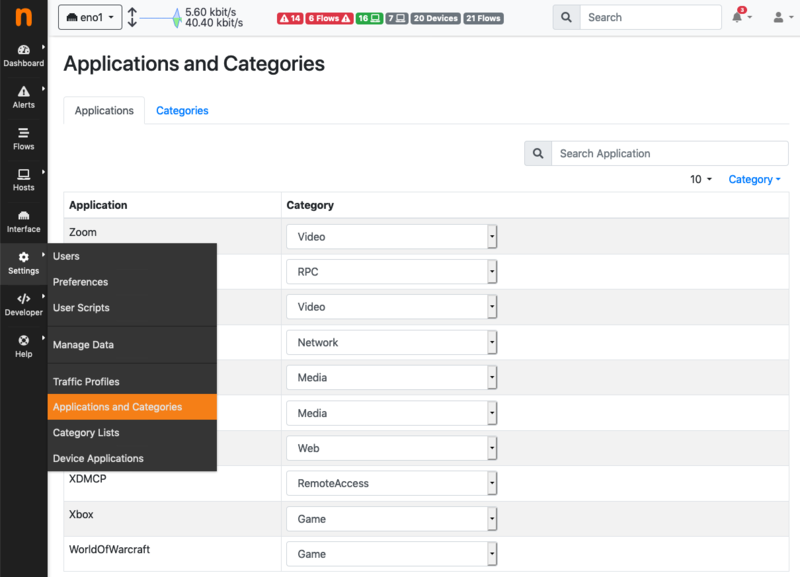 In the Applications tab it’s possible to configure the category associated associated with a particular application. An example for this configuration file is available here. to prepare it to be used by ntopng. After this feature is enabled, by clicking on the “Edit Rules” button it will be possible edit an application rules rirectly from the gui and add new protocols. It’s important to note that rules and new protocols will only be created and applied after a restart of ntopng. 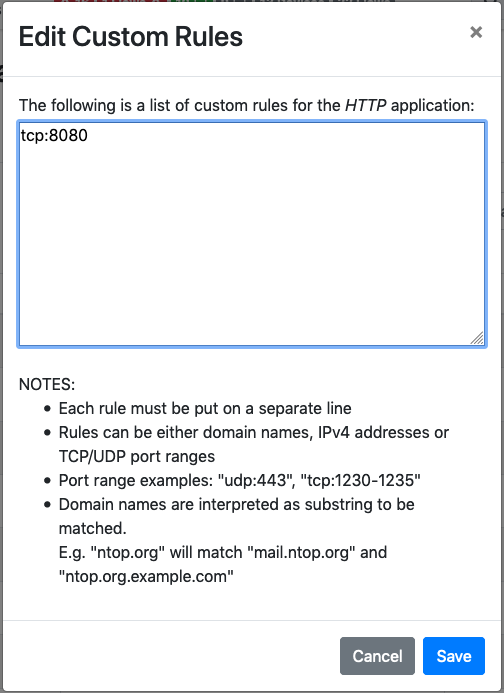 For example, the tcp:8080 rule in the example above tells ntopng to treat all the tcp traffic on port 8080 as HTTP. In order to delete a user defined protocol it’s necessary to clear all of its rules and save the changes. The protocol will be deleted after a restart of ntopng. As shown above, ntopng already assigns a default category to the known L7 protocols. Nevertheless, it’s also possible for the user to specify a list of additional hosts to be included into a particular category. 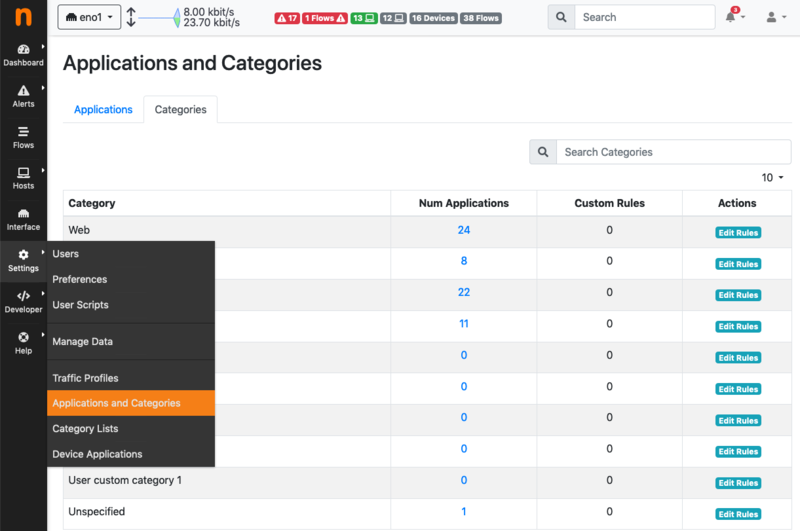 ntopng provides 5 empty “custom categories” dedicated to this task, but users are also free to modify the other categories. If a match is found, the flow category will be set to the corresponding matching category. These rules can be configured from the Categories tab. By clicking “Edit Rules” it’s possible to define some rules to match hosts and associate them to the category. 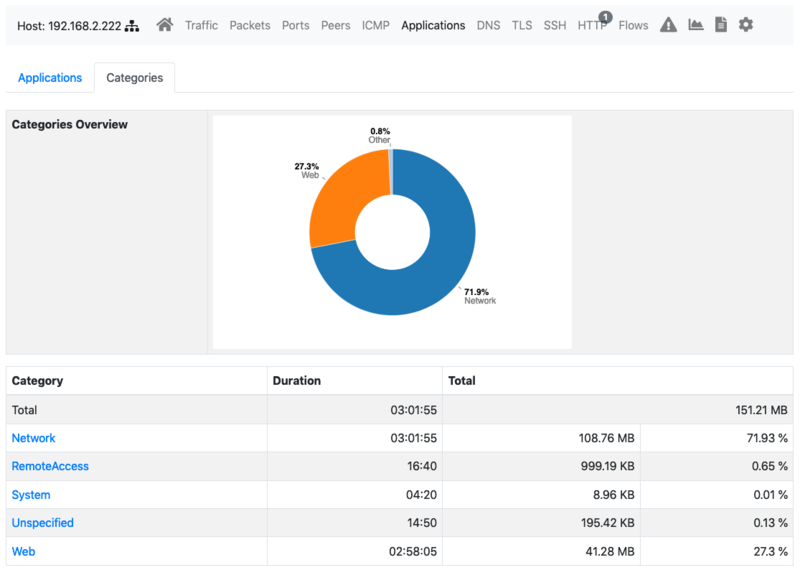 The picture above shows some custom hosts defined for the Advertisement category. For example, the .ads. host rule will match any host containing .ads. . It is important to play with the dots to avoid excessive matching (e.g. a simple ads rule would also match mads.com ). Note: host matching based on IP addresses is currently limited to IPv4 flows. 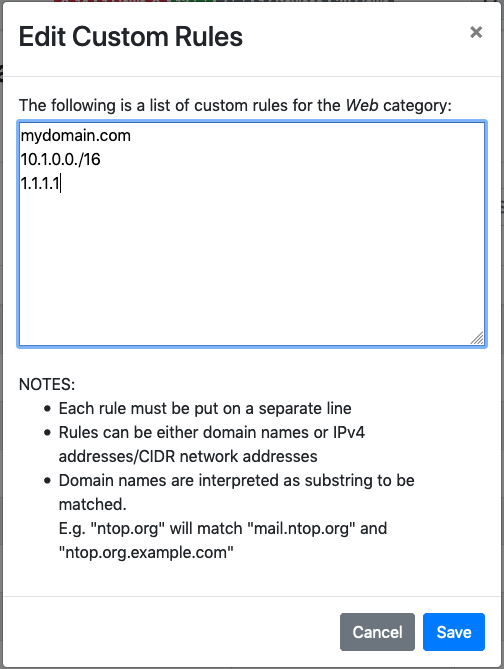 ntopng also supports external lists to define custom categories, loaded from text file (local) or online services (e.g. emergingthreats for the Malware category). Since lists are also used to raise alerts (e.g. for hosts in the Malware or Mining category), you may need to add exceptions to those lists, whitelisting selected hosts. This is possible adding an host to the list, prepending “!” to the IP/hostname (e.g. !1.2.3.4). 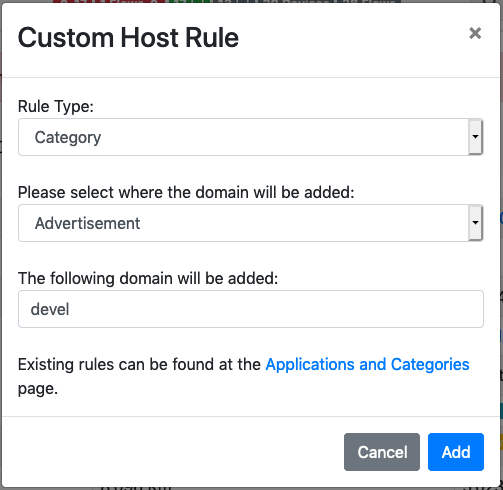 From the flow details page, it’s possible to click on the plus sign beside the flow SNI, DNS or HTTP host to easily create a rule to associate such host to a particular application or category.